Last week on 3/10/18, Dr. Castro presented her research on treating Lower Grade Gliomas by injecting a vector that allowed immune cells to identify and kill tumor cells. 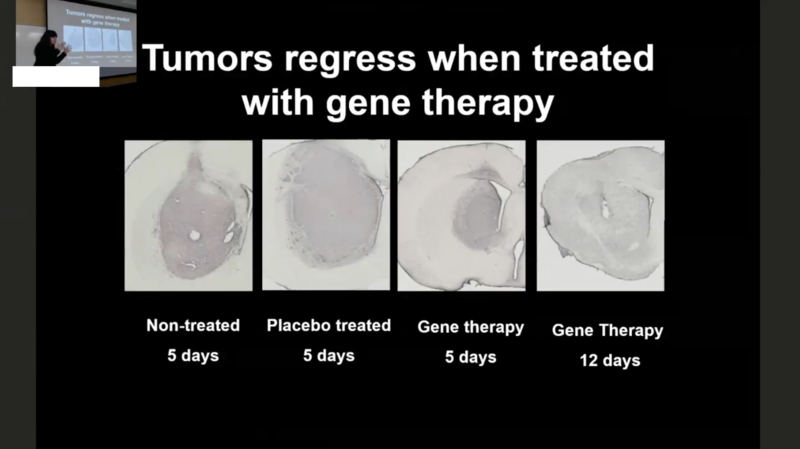 Her treatment hypothesis solves a big problem doctors have had with brain cancer. Since tumors grow in the brain, doctors must remove enough tissue to get rid of the cancer cells, but be careful they don’t remove too much as that can impact the person’s life. This is a big problem in children because their brains are still developing and removing too much tissue can cause developmental issues. Patients that undergo extensive surgery tend to live the longest, but they too still have a very big risk of another tumor growing again. In Dr. Castro’s model, immune cells are trained to kill cancer cells and this prevents the tumor from growing again. The have conducted many models in rats, and the rats that receive the treatment live longer. These rats have been injected with cancer cells in multiple regions of the brain, and everytime, the immune cells end up trained and effectively remove the tumors. Dr. Castro’s team have also injected the rats with cancer cells after they have successfully combated cancer the first time, and the rats survived. A question a student had asked if the rats had any scars left after the treatment that affected performance. Dr. Castro claimed that there was no behavior difference in the rats, but the answer could be different for humans. In conclusion, Dr. Castro’s research holds potential to increase the low rate of brain cancer survival. Maybe in the future, brain cancer will no longer be a death sentence.